Designing and constructing a home presents a unique project dynamic; people's homes are their sanctuaries, where they make the memories of a lifetime. They must be designed to be lived in, not simply "used." Lifetime costs play a major role in decision-making, materials must be carefully chosen and sourced, and spaces must be structured to be efficient yet enjoyable. Fundamentals of Residential Construction shows you how to bring it all together to turn a project into a family's cherished home. EDWARD ALLEN, FAIA, has a teaching career spanning more than thirty years, including as a faculty member at Yale University and the Massachusetts Institute of Technology, and is the best-selling author of The Architects Studio Companion; Architectural Detailing; Form and Forces; and Fundamentals of Building Construction, all published by Wiley. 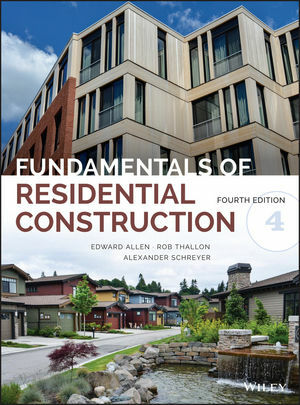 ROB THALLON, Associate Professor at the University of Oregon School of Architecture and Allied Arts, is the best-selling author and coauthor of Graphic Guide to Frame Construction; Graphic Guide to Site Construction; and Graphic Guide to Interior Details. ALEXANDER C. SCHREYER is Senior Lecturer and Program Director at the University of Massachusetts, Amherst, where he heads the Building and Construction Technology program and is a faculty member in Architecture. He is a wood engineering researcher and the author of Architectural Design with SketchUp, Second Edition, published by Wiley.